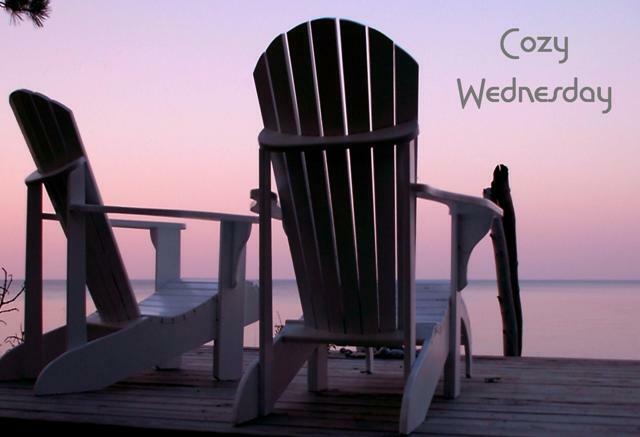 Cozy Wednesday with Zoe Chase – owner of the Biscuit Bowl Food Truck – Giveaway too! Fry Another Day finally hit store shelves yesterday and it was well worth the wait! Zoe Chase – owner of the Biscuit Bowl food truck is my guest today! We’re here in Atlanta – finally! The Sweet Magnolia Food Truck Race has been grueling so far. I was expecting some stiff competition from the other food trucks, but not the kind that comes with murder! I have to tell you that Uncle Saul, Miguel, Ollie, Delia have worked as hard as I have to make sure things go right. It hasn’t been easy with competitors like Our Daily Bread, Stick It Here, Meggie’s Mushrooms, and Pizza Papa. They have really pushed us to our limits. Plus the weird things the sponsors want us to do – making biscuits out of sweet potatoes, serving food on roller skates, and finding mystery food judges – have been a challenge. But what could I expect from a food truck race from Charlotte, NC to my hometown of Mobile, Alabama? Ten food trucks trying to win the $50,000 grand prize that will change our lives! Of course, the kiss Miguel and I shared could be a life-changer too! I’m so hopeful to be the last food truck standing, and make sure Miguel knows how I feel about him. It’s an exciting time in my life. I hope you will share it. See you on the road! Be sure to vote for the Biscuit Bowl! Spiced peaches were a hit for us during the food truck race. They aren’t hard to make, and have a cool, delicious zing! You’ll also need one small square of cheesecloth. Mix sugar and water in a heavy saucepan. Tie allspice and cloves in the cheesecloth. Add this, and the cinnamon sticks, to the water and sugar. Simmer peaches until tender; about 5 minutes. 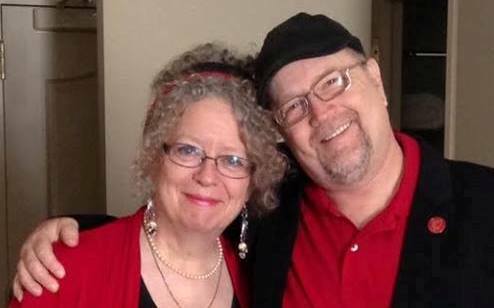 Joyce and Jim Lavene write award-winning, best selling mystery fiction as themselves, J.J. Cook, and Ellie Grant. They have written and published more than 70 novels for Harlequin, Berkley, Amazon, and Simon and Schuster along with hundreds of non-fiction articles for national and regional publications. They live in rural North Carolina with their family. Road Trip! Zoe and the Biscuit Bowl crew have entered the Sweet Magnolia Food Truck Race. Ten food trucks from the Southeast are all vying to win $50,000. Sounds like fun and it is until one truck vendors is found dead. What everyone thinks was a crazy accident is soon ruled a murder and Zoe’s attorney friend Miguel seems to be a prime suspect. Now Zoe is after more than 1 prize. The $50,000 and finding the real killer. It couldn’t really be Miguel…could it? Damn J.J. Cook has done it again! I couldn’t put this book down! Zoe, Ollie, Uncle Saul, Delia, Miguel and even Zoe’s cat Crème Brûlée are all back and traveling around the Southeastern part of the United States serving up their deep fried bread bowls with some very tasty fillings all to win a prize that would get Zoe a huge step closer to opening up her own sit-down restaurant. They are up for any challenge including wearing roller skates or serving patrons during a torrential rain storm. This story is just like a show you would see on the Food Network, well maybe not the murder, but you know what I mean. People will go on television and do just about anything for money. The author takes that and turns it sideways to include a murder mystery giving us an extremely entertaining read. The characters are engaging and all have their idiosyncrasies that cozy readers love. I enjoyed traveling with them from North Carolina to Georgia and home to Alabama. Never a direct route, there was always a monkey wrench or two thrown in along the way. The challenges were interesting and the “seat of the pants” method of producing the show probably happens more often than television viewers realize. Whether writing at J.J. Cook or their pseudonyms you can’t go wrong reading anything they write. They have something for everyone to love and always have a new book right around the corner. Happy Reading! Leave a comment for J.J. Cook for 5 Bonus Entries. I am really looking forward to reading this one! I thoroughly enjoyed the first book in the series. A story centered around a food truck sounds fun. it was fun to write, Melody. I hope it’s as fun to read! From reading your review of Fry Another Day By J.J. Cook, I know I need to start reading this series. The book sounds great! Thank you for the giveaway. I love your other series. Haven’t checked this one out yet, but will be checking it out soon. I love the food truck race on tv so will love this series. it looks great, hope to get a chance tow read it and thank you! Thanks for dropping by, Lisa! Thanks for hosting us here today, Lori! And for the great review! Nice to visit with you today! I loved the first book and was so excited to hear this one releasing. Thanks for the chance to win and congrats on the release. Thanks Debbie! And thanks for reading Death on Eat Street! This sounds like another great one to add to my ever growing TBR list. Thank you for stopping by, Ann! This book sounds wonderful and special. Thanks for this feature and giveaway. Lori is the best, isn’t she, Sharon? Food and traveling – sounds like a great combo to me! That’s what we thought too, Bobntoni! Another terrific book from these guys! Thanks for the giveaway. Love these book tours. I love this series. I am still reading Death on Eat Street and already in love. I am so tickled that this new book is out. Congratulations on your latest release J.J. Cook! Love the books from both of you! Added this to my Goodreads list. Another great addition from fabulous authors! I agree. That is a darling picture of the authors. Sounds like a lot of fun. Look forward to reading it. I just loved Death on Eat Street and would love to see what the gang is up to now. Sounds like this is going to be a fast paced, wild one for sure! Love the cover art and the fun title. LOL I do love my cozies! I absolutely loved this book and posted my review on Amazon today. Hope to eventually get a paperback of the book to share with my son (no electronics). I tried the peach recipe (as I like to try one or two recipes if they are in a book I’m reviewing and they are delicious! The “dessert” didn’t last a full evening in our home! Definitely looking forward to another Biscuit Bowl book. Another great series from Joyce and Jim. Don’t know how they do it but sure glad they do. Creme Brulee is a cute name for a cat! A food truck story sounds like it will be interesting. Count me in. Congratulations on the release! It looks like a good read and I’ve added it to my list of books to check out. Those spiced peaches sound fantastic! Can’t wait to read it! Thanks for the chance to win! MMMMMMM! I want some of those spiced peaches NOW! I’d make some if I could find some decent peaches in the grocery store. The spiced peaches sound good. I can’t wait to read this book as well. 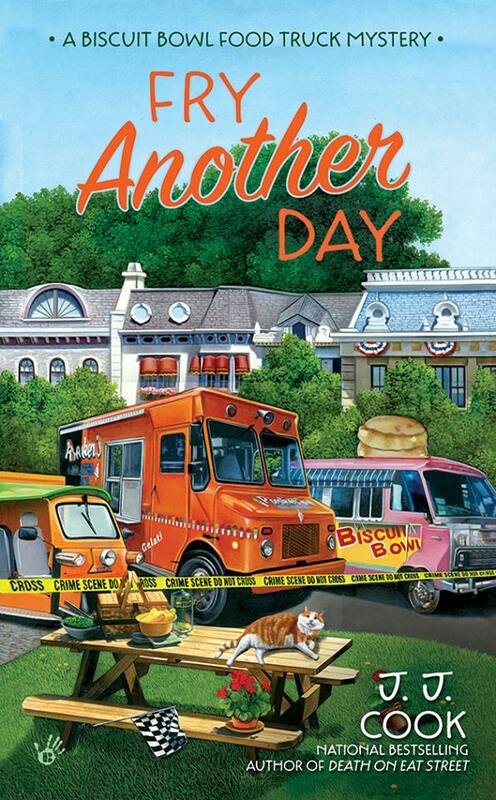 Looking forward to the new Biscuit Bowl Truck mystery – enjoyed the first one! Yes, the peaches look so good, there have already been a few in the grocery store here. thanks for the chance to win! Thank you for giveaway. Love cozies with food!!!! I love the food truck contests, this sounds like an awesome book! Thanks for the giveaway…looks good! I am encouraged to at least collect all your books in 2015 and read as many as are accessible and time permits. Love these authors. And food mystery!!! My favorite!! The Cunning Cruise Ship Caper by Sally Carpenter Great Escapes Book Tour – Review Special Guest – Duffy Brown – Author of Dead Man Walker – Review – Giveaway too! !